Bowling Green’s first outdoor hockey game is set to become a reality. The Falcons will face Robert Morris in a battle of Top 20 teams at noon Saturday at Fifth Third Field in downtown Toledo. The Falcons, 11-3-2 overall and ranked 13th nationally, have been idle since Dec. 5-6 when they posted a win and a tie at Northern Michigan. 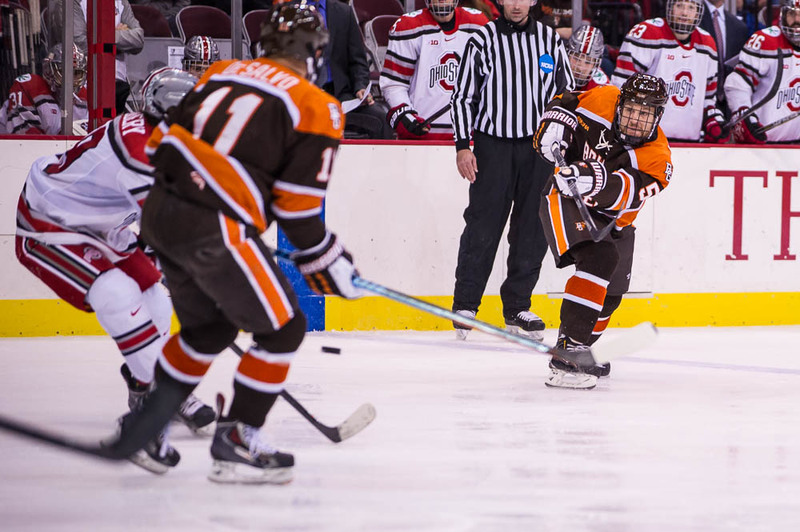 They returned to BG Sunday to start practice for the Robert Morris series. The teams play at RMU Sunday night at 7. The Colonials, ranked 19th, are 12-3-3. The Falcons and RMU both will practice for an hour at Fifth Third Field Friday, BG at 3:30 pm. and RMU at 4:30 p.m.
Fifth Third Field is the home of the Toledo Mud Hens, the Class AAA affiliate of the Detroit Tigers. The Toledo Walleye played the Kalamazoo Wings in an East Coast Hockey League game at Fifth Third Field last Saturday and drew a crowd of 11,222. The Walleye host Fort Wayne at Fifth Third Saturday at 6:30 p.m., following the BG game. A full size (200 feet by 85) ice rink stretches across the outfield. “Because we’ve been off for so long, the excitement is just to play another game,” BG coach Chris Bergeron said. “The excitement level will ratchet up when we practice there Friday when it’s actually real. Hafner is no stranger to outdoor hockey. He played in shinny games as a youngster on the outdoor rink at Ottawa Park in Toledo. Weather could be an issue Saturday, according to weather.com. The forecast calls for clouds early with a wintry mix expected to move in during the afternoon with a high of 34. Winds will be east/southeast at 5-10 miles per hour. One to three inches of snow and ice is predicted. “We just talked controlling what we can control and, unfortunately, the weather isn’t something we can control,” Bergeron said. “We won’t worry about it. Friday’s forecast is for a mix of sun and clouds, and a high of 33 with west/southwest winds at 5-10 mph. The Walleye are hoping for a crowd of 4,000-6,000 for the BG game. The BG-RMU game is part of the Walleye’s Winterfest, a 10-day celebration of winter activities. Public skating, as well as youth, high school and adult hockey games are being played at the stadium as well. The Falcon game against RMU was announced Feb. 3. “I don’t know when Derek (RMU head coach Schooley) and I talked last year about playing, either one of us thought we’d be in the Top 20,” Bergeron said. “But that’s where we are.